I guess I have never really posted a photo of my serving setup. I have a converted chest freezer with temperature control to dispense the brew from kegs ...therefore called a keezer....clever, right? I didn't come up with that name, the home brewing community did! The chalk board (used chalkboard paint) on the front is nice for updating the 4 beers on tap. I also encased the lid of the keezer with wood and stained it. I put 4" casters on the bottom of it so I can roll it away from the wall easily to load and unload kegs. It was getting difficult to slide a keezer full of kegs along the floor, I'm old. In the photo, you can also see the sweet tap handle my brother gave me as a groomsman gift for his wedding...it says "Lowell Brewing Co". I guess this is also "my area" of the house where I can hang my Red Sox memorabilia! Getting ready to pour a flight of brews for my lunch guests. 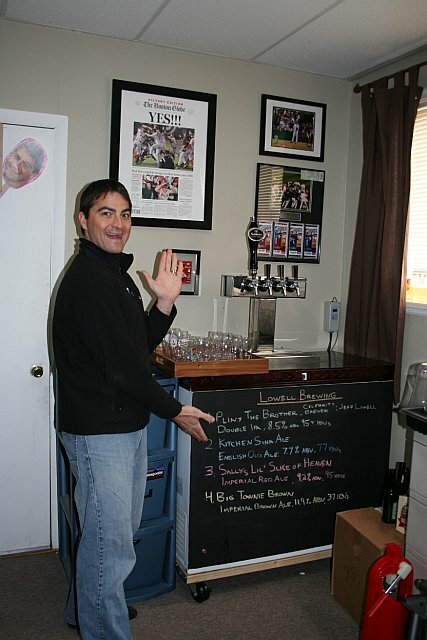 I'm making a stupid face, but it's a nice shot of the keezer...thanks, Abby. I'll be brewing TWO beers this Saturday in anticipation of my folks coming to visit at the beginning of May. I'll be making Blonde and Amber ales. Each of them won't be too hoppy, but will be well-balanced with the amber having slightly more malt character (this is how I hope they will turn out). My parents definitely have not embraced the hops yet and my Dad instantly gets a headache and is hungover every time he has a hoppy beer. No idea why that happens, but I feel like he'll start to acquire that taste for hops that all of us who live in Colorado have! My Mom usually likes the lighter beers, in both body and hops...the Blonde ale should be great for her. Wish me luck, it'll be a very long brew day! The beginnings of the beers...yeast and grain! I'm in for a brew day....let's talk schedule of events Friday night. I'll bring my back brace and ibuprofen. Man I love that keezer! Great idea on using the whole front as a chalkboard. It doesn't look like you needed to build a collar for it though - are you using ball lock kegs? Just curious on the make and model of that chest freezer given i'm on the verge of going the keezer route as well, but if I can do it w/out the wood work - that would be best. Thanks! I'll try and pull up the brand of the keezer and get it to you. Email me at the link on the left sidebar and I'll get back to you. I use pin lock kegs and I can fit four of them and a 20# CO2 tank in the keezer, with the compressor step empty. Shoot me an email and we can talk about it.